Sandy's Mom was discouraged! She lost her right hind leg due to cancer related disease a few years back and now she was struggling; she was having a harder time getting up and could only take short walks before plopping down in a heap. 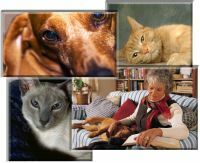 Sandy's veterinarian in Florida already had her on daily NSAID therapy. Her Mom was worried. When we first saw Sandy, she was struggling to get up and having trouble walking distances. Sandy's Mom noticed that she was less engaged in the activities of the house and that she was sleeping more and more. Initially, we broadened her pain medications to a more balance multimodal strategy. She responded favorably but the response was short lived. Within a month she had a crisis. She couldn't stand or walk. Her Mom thought it was her time. We thought it was time to bring a broader range of therapies to the fight. Strict weight control measures were initiated. Slentrol was incorporated into her program in order to reduce Sandy's hunger level and increase her acceptance of reduced food portions. Acupuncture and physical rehabilitation therapy were immediately included in her program. Within 4 days, Sandy was doing much better. Her pain levels dropped, her muscle strength and flexibility improved as did her balance and coordination. She gained more ground as she shed unwanted pounds. Sandy and her Mom returned to Florida at year's end. There was a tangible sense of optimism as we looked forward to seeing Sandy the following spring. The following spring we were thrilled to see that Sandy had made it through the winter. But the summer delivered another crisis for Sandy. Once again, her Mom thought it might be Sandy's time. 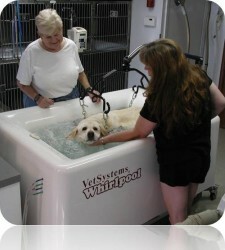 It was Sandy's love of our electro-stim whirlpool that reenergized Sandy and regained her Mom's optimism. We conducted additional physical rehabilitative therapy, adjusted her medications, and once again Sandy rallied. Once again we sent Sandy off to Florida hoping to see her the following year to celebrate her 13th birthday. But that was not to be. Sandy had a crisis in Florida and her Mom finally had to let her go. In the end, Sandy's Mom had gained an additional 18 months with her precious, gentle girl.